The full-back is set to join Scarlets. 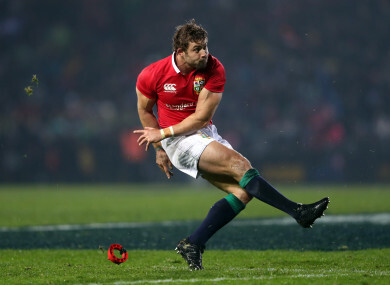 Halfpenny in action with the Lions this summer. LEIGH HALFPENNY IS set to return to Wales in a deal part-funded by the Welsh Rugby Union. According to multiple reports this morning, the Welsh fullback will join Scarlets over the Cardiff Blues, the region he left for Toulon in 2014. The 28-year old has been looking for a new club since Toulon owner Mourad Boudjellal announced in June that he would not renew his contract and it is expected that 60% of his salary will be picked up by the WRU under a national dual contract. Halfpenny had been tipped to rejoin the Blues but the two sides hit a stumbling block when it emerged he wanted a contract that would see him released after the 2019 World Cup. With 71 caps for his country to his name, Halfpenny will be a replacement for Liam Williams who joined Saracens from the province. Email “Halfpenny set to choose Scarlets over Cardiff Blues”. Feedback on “Halfpenny set to choose Scarlets over Cardiff Blues”.